How to share USB drive on Network. This article understands the necessary components which can be used to share USB drive on network. USB over IP Devices are used for sharing USB drives on the network. The devices typically contains an ethernet port which is connected to the network. The device also contains provision for accommodating single or multiple USB drives. A step by step procedure for deploying the device on the network is described below. Purchase the USB over IP Device. Connect the LAN port of the device to any switch port on the network. 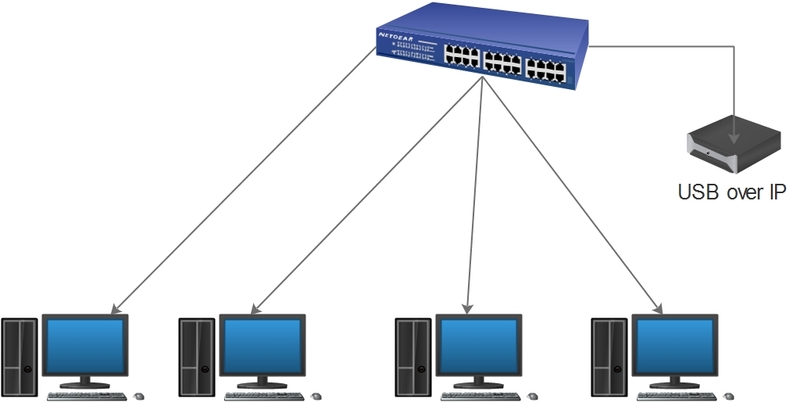 Configure an IP address using static or DHCP settings available on the network. Connect the USB drives on the appropriate ports on the device. Connect to the device using appropriate software utility which typically comes along with devices.